Christopher and William Ko are missing. Please help bring them home. 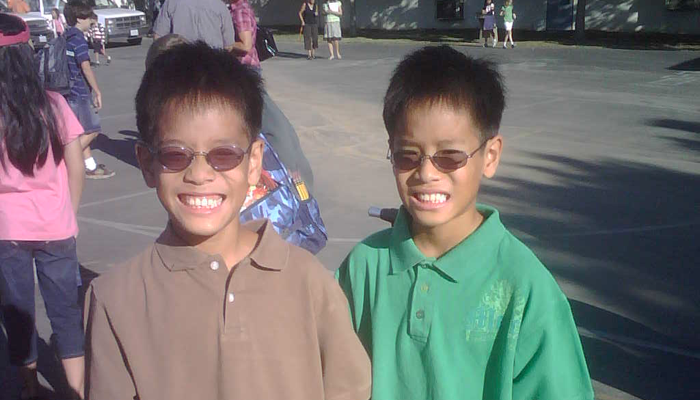 On Sunday, August 30, 2009, nine-year-old twins Christopher and William Ko played basketball with their dad, Andrew Ko. That afternoon, they hugged and kissed him goodbye, expecting to see him in a few days, per the joint custody arrangement that had been in place for several years since the Ko’s divorce. But Monday, when they should have been going to their fourth grade class in Los Angeles, their mother, Mei Wang, had made other plans. Instead of taking them to school, she took them to LAX, kidnapping them to Singapore with foreign passports obtained through the Singapore consulate without the knowledge or consent of the boys’ father. Her actions were in defiance of a US court order prohibiting either parent from taking the boys out of the country without the other’s permission. Today, more than a year later, they remain in Singapore despite an Interpol Red Alert for Wang and four felony arrest warrants for kidnapping issued by the Los Angeles District Attorney. We need your help to bring them home. Christopher and William Ko are missing. Please help bring them home. March 15, and the healing has begun.